​Watch out for these plants! Plants are important to the environment and provide numerous benefits to the habitats where they grow. Unfortunately, some plants can have detrimental effects to the environment and sometimes even human health. ​​Giant hogweed is an invasive plant originating from southwest Asia, and has been identified in several locations in Ontario. It grows best in habitats like old fields and open woodlands, and has been found growing in ditches, streams and along roadsides. This plant spreads quickly and crowds out native plant species, which in turn decreases biodiversity. Height: Taller than 8 feet. Stem: Green with purple blotches and rigid hairs. Leaves: Leaves are spiked with a pronounced jagged appearance. Cow parsnip is a perennial native plant that is commonly found in Ontario. 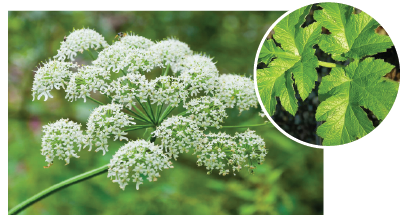 Much like giant hogweed, cow parsnip can be found in a wide variety of habitats including grasslands and old fields, it grow best in habitats with moist soil and a lot of shade. Cow parsnip is often confused with giant hogweed, but this plant is native and is usually smaller. Stem: Deeply ridged stems that may be green or slightly purple with fine, soft, fuzzy hairs. Leaves: Leaves are 2 - 2.5 feet and covered with soft hairs that may give it a velvety appearance. Flower: White flower clusters up to 1 foot across. 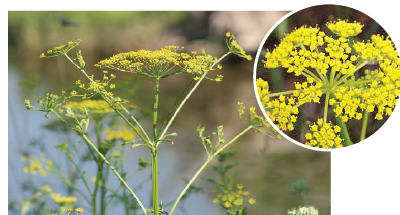 Wild parsnip is an invasive plant originally from Europe and Asia that has been identified in scattered locations in eastern and southern Ontario. This plant grows and spreads rapidly in abandoned open fields, meadows and railway embankments. It is able to spread quickly because its seeds can be easily distributed by wind and water. Height: 2 - 5 feet tall. Stem: The stem is light green, with purple blotches and deeply grooved. Leaves: Compound leaves with a main stem with 5 - 15 leaflets. ​What should you do if you find a toxic plant? REPORT THE SIGHTING to the Invading Species Hotline at 1-800-563-7711. Note that this line is receiving a number of calls about the issue. It may take some time for them to respond to your enquiry. Please be patient. CALL A LICENSED PROFESSIONAL, if you want it removed from your private property. Please do not try and do this yourself. If you find one of these plants at one of our conservation areas, please contact us as soon as possible to report the sighting. 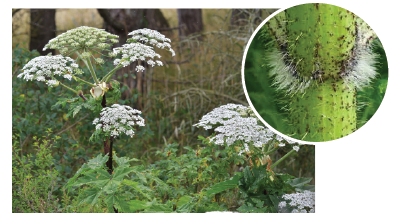 F​​ind out more about Giant Hogweed and what you should do if you find some. Learn more about invasive species here.